China Rare Earth Magnet Limited manufactures neodymium magnets into a variety of shapes. Block magnets are very common. Some customers call it rectangular or square or cube magnets. How to enquire and order NdFeB block permanent magnets? The following information is necessary to be provided when making enquiries and placing order. 1. Size: length x width x height, L x W x T (through hole D) and etc. Tolerances: allowed variation range in dimensions, ±0.1mm, 0/-0.2mm, +0.1/-0.25mm and etc. 3. Magnetization orientation: magnets to be supplied in magnetized or un-magnetized condition? The orientation is across thickness or width or length? Multi-poles magnetized? 6. Conditions and application of magnet (optional): maximum temperature, humidity, outside, inside, etc. Remark: For very big neodymium magnets, we always suggest sea transportation, because it is difficult to shield the magnetism, magnetism cannot be totally shielded. We supplied custom made variant types of neodymium block magnets for our customers. 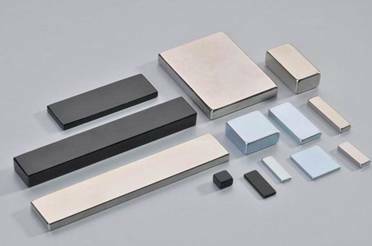 If you are looking for same or similar shapes of permanent magnets, please contact us and provide the drawing and specifications of the magnets desired. 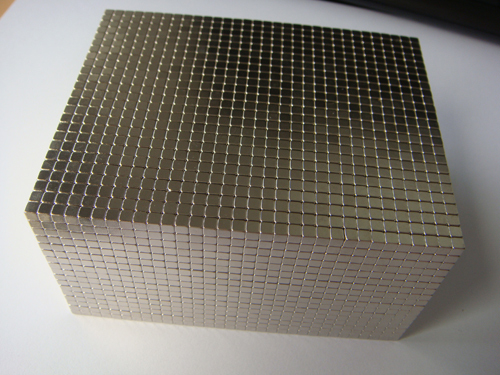 China Rare Earth Magnet Limited customizes block magnets in various sizes, like neodymium mini magnets 0.5x0.5x0.5mm, 0.2x0.2x0.2mm, big magnets 100x50x50mm, 120x120x20mm, 150x100x20mm, 2"x2"x2", 200x60x10mm, etc. 2"x2"x2"xd10mm/N50M/Black epoxy/Magnetized through Thickness 2"